Co-Creative Gardener's Kit - Perelandra Ltd. The Co-Creative Gardener's Kit was introduced in The Perelandra Garden Workbook. Each co-creative gardener puts together his or her own gardening kit. The following are important and helpful items for "Gut Gardening" and "Gardening 2.0." ETS for Soil, 2 oz. Essence of Perelandra, 2 oz. 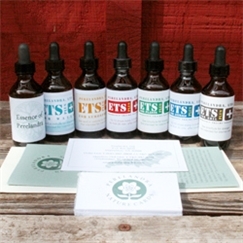 ETS for Humans, 2 oz. Machaelle explains how to use the Solutions for your garden in the Garden Workbook. ETS for Atmosphere, Water, Soil, Plants and Animals are five liquid solutions that were developed at Perelandra. They contain electric patterns to be used in any environment for repairing damage experienced by water, atmosphere, soil, plants and/or animals. Essence of Perelandra (EoP) provides a stabilizing, supportive, balancing strength to your garden and/or your property. We refer to EoP as "balance in a bottle." It contains the pattern that captures all of the elements within each level to create the unique balance called "the Perelandra garden." By including EoP in your garden, you're adding a deep foundation of balance from Perelandra. Your garden's progression will take a giant leap forward, and its production will take another leap forward in quantity and quality. ETS for Humans is for those times we gardeners encounter any sudden or "unscheduled" physical, emotional or mental situation that can be large or small, serious or passing. You will be using all of these Solutions along with the Soil Balancing Process Kit for the balancing processes in Part Four of The Perelandra Garden Workbook, and the 2.1 Troubleshooting Process for your garden, or any environment. As co-creative gardeners, there are times when we get backed into a corner and we don't know what questions to ask nature, or we feel limited with the PKTT format, or we just want more information. This is where the Perelandra Nature Cards come in. The set of twenty-two cards was put together by nature to be used as another communication tool by us. If you are sensitive to brandy, you may order your Essences and Solutions preserved in distilled white vinegar. The prices are the same.